Thanks to the large force available for actuation and the use of the steel/sinter combination, which has very low wear characteristics, hydraulically actuated Ortlinghaus Sinus® multi-plate clutches, brakes and clutch/brake combined units are suitable for a range of applications in mechanical engineering, motor vehicles and transmission systems. The cooling oil, which is led through the plates in a precise manner, allows the heat, which varies depending on the particular application, to be dissipated efficiently. To a very large extent these clutches and brakes are wear free and require no maintenance! Clutch/brake combined units are recognized as being safe and reliable for driving presses, metal-forming and machine tools, shears and similar machines. They conform with the well known safety requirements as laid down in the relevant EC directives. The torque transmitting capability and the switching capacity can be influenced over a wide range, by the correct selection of the number of friction surfaces. The heat generated from a particular application can be dissipated efficiently with the aid of a carefully designed cooling oil system. The shaft hub connection is with a double keyway in the case of series 0-023; in the case of series 0-123, either a double keyway or a locking assemble can be selected. Friction combinations: Steel/sinter linings Operating pressure: 60 bar. Pressure and cooling oil intake: Via rotary inlet through the shaft. Application: In stamping, embossing and drawing presses, in automobile body presses, shears and similar machines. This hydraulic clutch version can be put to use universally as a compact machine transmission clutch. Examples of application: In transmissions for machines and vehicles, stationary and mobile cranes, other lifting devices. A hydraulic clutch for heavy-duty drives; normal version with shoulder housing and without “emergency engagement facility“. A version with “emergency engagement facility“ is also available. Large hub bores are possible. These hydraulic clutches can be manufactured to conform to the acceptance conditions of the classification institutions for marine engineering. Areas of application: Used in marine engineering for reversing gears, variable pitch propeller drives and multi-motor drives. 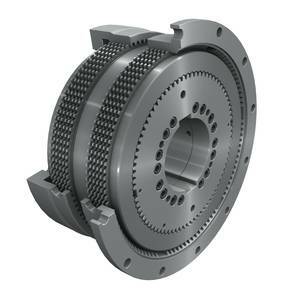 A hydraulic clutch for heavy duty drives of all types in which a high level of engaging/disengaging work has to be performed; normally supplied with a flange or shoulder housing and without “emergency engagement facility“. A version with “emergency engagement facility“ is also available. These clutches can be manufactured to conform to the acceptance conditions of the classification institutions for marine engineering. Areas of application: Used in marine engineering for reversing gears, variable pitch propeller drives, multi-motor drives and power take off drives. Spring-applied fail safe brakes with a housing which does not have a centering function; for this reason these brakes are primarily used on shaft ends and outside gearboxes. Variations include a closed end flange and an open end flange, which would allow a shaft to pass through. The “wet-running plates“ are lubricated initially by soaking in oil or by means of oil stored in the plate chamber, depending upon the particular application. The brakes can be released mechanically in the case of a hydraulic system failure (emergency release facility). Pressure oil intake: On outside of diameter of stationary cylinder. Application: Extensively used throughout the field of mechanical engineering especially as brakes for hydraulic motors used in cranes and winches. Spring-applied fail safe brake in which the housing has both a centering and a load carrying function. The “wet-running plates“ are lubricated initially by soaking in oil or by means of oil in the chamber, depending upon the particular application. Pressure oil intake: On outside diameter of stationary cylinder. Application: Generally within a transmission between motor (hydraulic motor) and driven device. This is a short brake for use in designs where space is limited. The housing has both a centering and a load carrying function. Application: In gearboxes of every type, cranes and other lifting devices.